Daniel Boardman Residential Design is an Austin, TX based residential design firm that specializes in the architectural design of custom homes, home additions and kitchen remodeling designs. Our firm works one-on-one with clients to develop a set of building plans that are used to acquire construction bids, building permits from the city and properly construct a client’s customized home. Through every step of the process, we work with our clients to develop plans that will incorporate their unique taste and design visions. The client-firm collaboration will result in amazing spaces that use open design concepts connecting the interior space with flowing exterior living spaces. Our firm will communicate a strong priority on energy efficiency by integrating the most cutting edge and energy efficient construction technology to each design. For each customized architectural style, we fit the house design to the lot and orientation to the sun that will strategically exploit sunlight to highlight stunning open areas. At Daniel Boardman Residential Design, our ultimate goal is to take the ideas and vision of the home owner and make them a reality with a home filled with happiness and beauty for many years to come. Creating custom homes since 1989, my perspective and focus is to provide the client with a home that realizes their dream, by listening to their desires and creating an environment that meets their aesthetic aspirations as well as their comfort and entertainment needs. Burnet County's Expert Architectural Design Firm | 2X Best of Houzz! If you've wanted a custom contemporary home for a long time but don't know where to start, you've found the right place. Unique modern homes over $1mm are all we design. We guide you through the process of envisioning and realizing your home in the most time and cost-effective way possible -- a home that fits your needs and budget, and expresses your personal style in a way you never thought possible. Serving clients throughout Texas, as well as nationally, we offer an exceptional level of personalized service for those seeking the utmost in international-style, mid-century and luxury design. Founded in 1989, Cornerstone Architects is an architectural design firm based in Austin, Texas. Cornerstone specializes in architecture and interior design for both residential and commercial projects. Cornerstone’s international experience includes both commercial and luxury residential projects. Our varied portfolio consists of retail, restaurant, recreational, resort, multi-family, office, medical, religious, and single family residential projects. 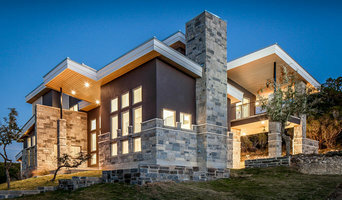 The firm’s design approach blends architectural, interior, and sustainable design disciplines to create a uniquely balanced cutting edge architectural solution for each project. Danze & Davis Architects, Inc.
Black + Vernooy has built an award-winning architecture practice around the idea that celebrating the unique qualities of each site and client results in functional, thoughtful, and responsive homes. We provide accommodating, comfortable environments for observing nature, entertaining, relaxing, working, and living, imbuing the architecture of Black + Vernooy with a "sense of place." This unique sense of place seeks harmony with the natural landscape and climate, native materials, and strives to produce a lasting, well-designed architecture exceeding client expectations and producing continual and unexpected delights. Our philosophy on designing homes is simple - Design a comfortable and livable home, within budget, on-time, and environmentally friendly. Your next home should be the home of your dreams. Elliot H. Johnson, AIA has been a leader in green building in Austin, Texas, and an active member of the City of Austin Green Building Program since 1992. 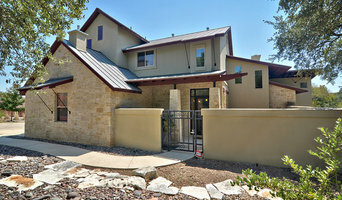 Images Of... has completed the design of numerous five-star rated houses (City of Austin Green Building Program), and we have designed eleven Net-Zero or Net-Zero capable homes. 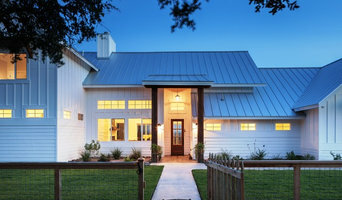 Images Of... has a proven track record of designing comfortable, family oriented custom homes throughout Austin and the Hill Country varying from 1,300 to 9,000 square feet with budgets of $150,000-$3,200,000. These energy efficient, affordable, well built homes have been designed in numerous styles, including: French Country, Mediterranean, Tuscan, and Texas Country. They are tailored to each unique site, the client's vision and their lifestyle. Danze & Davis Architects is an Austin-based Architectural firm built on the fundamental value of creating good design delivered in an efficient and timely manner. We have over 50 years of experience in achieving exceptional results. Businesses and families across the nation have trusted us for their residential, multifamily and commercial architecture. We have earned national recognition for our work, which combines functionality with high quality and design. Our continued tradition is providing everyone with outstanding design no matter what the budget is or what level of service is required. With our team's creativity, experience, talent, education and passion, we can help determine the best layout to take advantage of unique characteristics that your land possesses. We can help bring to life the architectural style, size and amenities that fit your needs. We help home buyers get the home of their dreams within their budget. Let us help you create your dream home. Geschke Group Architecture specializes in site-specific Custom Residential Projects. We are dedicated to creating exceptional Architecture by providing our clients with Personal Service, Professional Guidance & Ability and Honest Commitment. We create designs that are not only Attractive and Elegant but are also designed Intelligently, Efficiently and with the Owner’s needs in mind. We pride ourselves for our accurate and thorough Construction Documents that result in a seamless and uncomplicated Construction phase. Our process will take you from Preliminary Design to Construction in easy steps, breaking down the project into manageable portions that will not only make the process easier but also enjoyable and stress-free. We realize that a close collaboration within the team of Owner, Contractor, and Architect is paramount to a successful project. We love and are passionate about our work, and enjoy the Personal and Long-term Relationships that we form with each of our clients. We also want to stress that we do not come to the table with an agenda, and strongly believe that each Project should be a reflection of the Owner’s needs, not of the Architects. We provide Architectural and Interior Design Services for Single Family Homes. Site specific solutions are based upon functional requirements and the "genius of the place". Our work is characterized by thoughtful design and quality craftsmanship. Each project is a unique solution that marries the personality of the home-owner to the context of the building site. We are based in Austin but are open to travel. The principals of Element 5 Architecture bring separate interests and specializations that combine in a distinct architectural approach and allow us to accept commissions for a broad range of projects – from small residential designs to larger scale urban developments. We approach each project by analyzing the environmental influences on a site and seeking a solution that’s both aesthetically pleasing, energy efficient and meets our clients’ goals. We have a particular interest in energy efficient design, modern architecture and keeping to a strict budget. Feel free to reach out to us, we would love to hear from you! Boutique Architectural design firm specializing in contemporary design. We have considerable experience with many different project types, including single-family homes, apartments, condos, retail, restaurant, offices, as well as civic buildings such as libraries and museums. John Puhr founded Root Architecture in Austin, Texas in 2011 after more than ten years of developing many different facets of the practice of architecture. The foundational principles of materiality, context, and craft John learned early on are still at the root of his practice today. Webber + Studio, Architects specialize in direct solutions to architectural problems, using a guiding set of principles: Functionalism, Expressionism, Regionalism, and Minimalism. Setting a priority on the client's and site's needs, The Studio’s rigorous approach has yielded a diverse and innovative body of work. Since 1997, Webber + Studio has brought this award winning sensibility to all of their projects. C REESE DESIGN is a full service design firm providing residential architectural, interior design, as well as commercial space planning. Our firm focuses on the client's objectives with a distinctive use of form, material and color to accommodate the goals of each individual client - whether the objective is cutting edge, exclusive high end, or unique character within a tight budget. 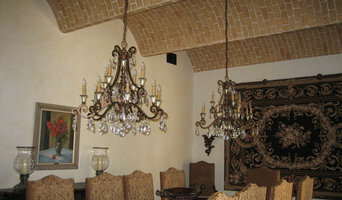 We design custom homes that are distinctive in style and character to reflect our client’s unique tastes. C REESE DESIGN also works closely with your general contractor and assists you in securing a general contractor so that special design elements and budget considerations can be made during the design phase. We believe very strongly that taking a team approach among the designer, builder, and owner is critical for a smooth running project with optimum results. Feel free to reach out to us, we would love to hear from you! Architectural design - specializing in custom home design, additions, renovations, and interior design. 9 square studio is a full service architectural firm providing residential design services in and around Austin. From kitchen remodels to new construction, Nana is fully committed to understanding and executing the clients' vision. She values the collaborative process with clients as well as builders and believes that it results in a more successful and interesting project. How do I find the best Granite Shoals architect for my home design project? It is best to hire a home architect who will be involved in all phases of the design process, from the initial concept to the completed construction. The architect is often the first person you will hire for your project. If necessary, they might also help you select and hire Texas subcontractors, which can include the builders, engineers and landscaper. Interior architects are also involved in negotiating contracts for all involved participants. It is for these reasons that it is extremely important for you to have a good relationship with the Granite Shoals residential architect you hire. He or she can be the tie-breaking vote between you and the general contractor and can be your biggest advocate during the construction process. Different architecture firms in Granite Shoals, TX provide different services, so the scope of the work can span from pre-design environmental impact studies to selecting furniture and finishes, depending on what your specific needs are. It is very important to hire the right professional for the job. Remember that the most well-known or established designer might not provide the best architectural services for your needs. It all comes down to the individual project. Research and ask people whose work you like for recommendations. It's important to have somewhat of an idea of the style of house architecture that you prefer, as well as the amount you would like to spend. Residential architects in Granite Shoals, TX are natural problem solvers. They will assess the entire situation and help you to solve your problems too. Don't settle for a single company too early. Call and interview a few. Make sure that you feel like your personalities will mesh well and that you like their professional perspective. Find a home architect in Granite Shoals, TX on Houzz. Narrow your search in the Professionals section of the website to Granite Shoals architects. You may also look through photos of Texas projects to find interior architects and building designers who have worked on a project similar to yours.